One of the field’s leading research centers has produced an essential and up-to-date resource covering two fields not normally brought together in the literature. Professor Sorai is a world-recognised expert in the field of thermodynamics and leads key researchers to provide complete coverage of the subject without overloading the reader. 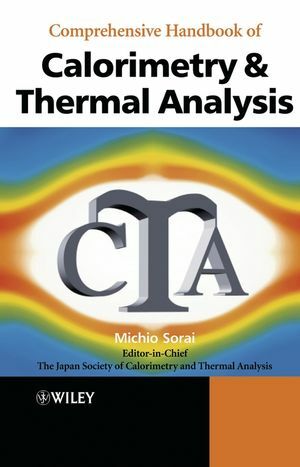 The Japan Society of Calorimetry and Thermal Analysis and Michio Sorai are the authors of Comprehensive Handbook of Calorimetry and Thermal Analysis, published by Wiley. Part I PRINCIPLES OF CALORIMETRY AND THERMAL ANALYSIS. 1.1.2 Thermodynamic quantities characteristic of multi-component system. 1.1.3 Thermodynamic quantities characteristic of surface and interface. 1.1.4 Thermodynamic quantities in chemical reactions. 1.1.5 Thermodynamics of non-equilibrium states. 1.2.2 Thermal analysis for chemical reactions. 1.2.3 Thermal analysis for mechanical properties. 1.2.4 Dynamic viscoelastic phenomena and thermal analysis. 1.2.5 Reaction kinetics in the solid state. 2.1 Temperature Measurement in Thermal Study. 2.2 Principles and Methods of Calorimetry. 2.2.1 Classification and basic principles of calorimeters. 2.2.2 Adiabatic heat capacity calorimetry. 2.2.3 Heat capacity calorimetry by relaxation method. 2.2.9 Calorimetry under magnetic field. 2.2.12 Heat of vaporization and sublimation. 2.2.14 Heat of solution and mixing. 2.2.15 Heat of immersion and adsorption. 2.2.19 Calorimetry at extremely high temperatures. 2.2.20 Adiabatic differential scanning calorimetry for biothermodynamics. 2.3 Principles and Methods of Thermal Analysis. 2.3.1 Thermogravimetry (TG) and controlled-rate TG. 2.3.2 Differential thermal analysis (DTA) and differential scanning calorimetry (DSC). 2.3.3 Thermomechanical analysis (TMA) and dynamic mechanical analysis (DMA). 2.3.8 Micro thermal analysis by scanning probe microscopes. 2.4.1 Determination of thermal expansivity. 2.4.2 Steady state method of determination of thermal conductivity/diffusivity. 2.4.3 Transient method for determination of thermal conductivity/diffusivity. 2.4.5 Determination of electromotive force. 3.1 Data Analysis of Calorimetry. 3.1.2 Phase transition and normal heat capacity. 3.1.3 Determination of partial molar quantities. 3.1.4 Statistical thermodynamic analysis in biocalorimetry. 3.1.5 Data analysis in titration calorimetry. 3.2 Techniques of Thermal Analysis and the Data Analysis. 3.2.1 Solid-state reaction kinetics by TG. 3.2.2 Baseline and thermal anomaly in DTA and DSC. 3.2.3 Heat capacity measurement by DSC and TM-DSC. 3.2.4 Analysis of isothermal crystallization by DSC. 3.2.5 Glass transition and relaxation phenomena. 3.2.6 Determination of phase diagrams by DTA/DSC. 3.2.7 Purity determination by DSC. Part IV HOW TO UTILIZE THE THERMODYNAMIC DATABASE. 4.1 Thermodynamic and Related Database. 4.1.1 Recent development of thermodynamic database systems. 4.2 Utilization of Thermodynamic Database. 4.2.1 Calculated phase diagram vs observed phase diagram. 4.2.2 Application of chemical equilibrium calculations. 4.2.3 Application of chemical potential diagram. 4.3 Thermodynamic Database for Biomolecules. 5.1.1 Thermal analysis of amorphous alloys. 5.1.2 Thermal analysis of hydrogen-absorbing alloy. 5.1.3 Thermal analyses of heat-resistant type steels and alloys. 5.1.4 Thermodynamic analysis of liquid alloys by temperature-jump calorimetry. 5.1.5 EMF method with solid electrolyte for liquid alloys. 5.1.6 Construction of alloy phase diagrams. 5.1.7 Electronic density of states of quasicrystals. 5.1.8 Kinetics of oxidation in thin metal films. 5.1.9 Lattice-defect concentration in solids from thermal expansion. 5.2 Inorganic Materials and Ceramics. 5.2.1 Heat capacity of UO2 up to 8000K. 5.2.2 Battery materials: Spinels containing Mn for lithium secondary battery. 5.2.3 Thermal conductivity of diamond film. 5.2.4 Kinetic features of the thermal dehydration of inorganic hydrates. 5.2.5 Dehydration of inorganic salts under reduced pressure. 5.2.6 Thermal analysis of water-containing silicate minerals. 5.2.7 Heat of adsorption and evaluation of active sites on the surface. 5.2.8 Nonstoichiometry of oxides by constant temperature TG. 5.2.9 Heat of hydration of zeolite. 5.2.10 Heat capacity of yttria-stabilized zirconia. 5.2.11 Acoustic emission and thermal analysis of phase transitions. 5.2.12 Pore-size distributions in silica gels. 5.2.13 Calorimetry for fast ion conducting glasses. 5.2.14 Negative thermal expansion of ZrW2O8. 5.2.15 Calorimetry of high-pressure minerals. 5.2.16 Heat capacity of diamond and graphite. 5.2.17 Heat capacity anomaly in lead-based complex perovskite relaxors. 5.3 Organic Materials and Polymers. 5.3.1 Strain and resonance energies of fullerenes. 5.3.2 Heat capacity of molecular monolayers. 5.3.3 Entropy of transition of mixed crystals. 5.3.4 Glass transition and residual entropy. 5.3.5 Heat capacity of exotic superconductors. 5.3.6 Magnetic dimensionality and spin-wave excitation of molecule-based magnet. 5.3.7 Calorimetry of liquid crystals. 5.3.8 Alkyl-chain-length dependence of entropy of transition. 5.3.9 High-pressure DTA of liquid crystals. 5.3.11 Melting of polymer crystals studied by temperature-modulated DSC. 5.3.12 Origin of double melting peaks of drawn nylon 6. 5.3.13 Glass transition and relaxation in polymers. 5.3.14 Thermal decomposition of polyurethanes containing natural compounds. 5.3.15 Curing of epoxy resins containing plant components. 5.3.16 Phase transition in spin-crossover complex. 5.3.17 Frequency-dependent heat capacity near a glass transition. 5.3.18 Heat capacity of molecular magnets under magnetic field. 5.3.19 Micro thermal analysis of polymers by scanning probe microscopy. 5.4.1 Phase transition of lipid. 5.4.2 Thermal stability and function of Myb protein. 5.4.3 Thermal stability of mutant lysozymes. 5.4.4 Stepwise melting of plasmid DNA in the presence of Mg2+ ion. 5.4.5 Volume and compressibility of proteins. 5.4.8 Molecular recognition of antibody. 5.4.9 Glass transition of protein. 5.5.1 Purity determination of medicines by DSC. 5.5.2 Evaluation of polymorphic transformation of drugs. 5.5.3 Determination of heat of hydration and hydration kinetics of theophylline hydrates. 5.5.4 Inclusion compound formation between host material and medicinal molecules. 5.5.5 Estimation of initial dissolution rate of drug substances by thermal analysis. 5.5.7 Effect of drugs on microbial growth activities. 5.5.8 Drug interaction in human blood. 5.6.1 Phase transition of glycolipids. 5.6.2 Sol–gel transition in polysaccharides. 5.6.3 Phase transition of polysaccharide helix. 5.6.4 Interaction between starch and water. 5.6.5 Novel biomaterial–water interaction produced by heat treatment. 5.6.6 Nonfreezing water in food. 5.6.7 Quantitative evaluation of food putrefaction. 5.6.8 Thermal analysis of various plant materials. 5.6.9 Dynamic viscoelasticity of hair. A.1 The international temperature scale of 1990 (ITS-90). A.2 Electromotive force of thermocouples. A.3 Standard reference materials for thermal analysis. A.4 Symbols and notations for thermodynamic and related quantities and their printing. A.5 Guidelines for presentation of experimental results.